Thallium Sport is a masculine fragrance by Jacques Evard. There are 10 reviews of Thallium Sport. To me, this has a lot of the original in it; but instead of traveling down the gourmand road, it goes the typical sport fragrance route, but with a little more sweetness. When I first sprayed it on, I thought of Allure Edition Blanche, but with more tonka sweetness. To me, in a nutshell.. Thallium Sport is Thallium, but replace all the fruity notes with mostly lemon, tone down the projection, and longevity. Longevity is actually quite bad on this one. That doesn't bother me though, since this type of scent has already been "played out" to death. Not worth buying, stick with the original. I bought a full bottle of this because it's very cheap but also because I sprayed it on a tester strip and took it home and I kept coming back to it because it smelled so good. I've tried wearing it a few times now and I don't like it all that much on my skin but now I'm trying it on my shirt instead and just like with the test strip, it smells amazing. I've read from others on here that some fragrances are better on skin than clothes and vice versa, so this one is a clothes only scent for me. Citrus top notes and a musky base. A great scent! I just wish that it lasted longer, and projected a bit better. Inexpensive, and it shows. Nonetheless, a great fragrance! The top is made up of bergamot, pineapple, and "oxygen accord", but just underneath this is a pronounced torso of equal parts orange, lime, and cedar. I have to say that this is a very sweet citrus bomb. 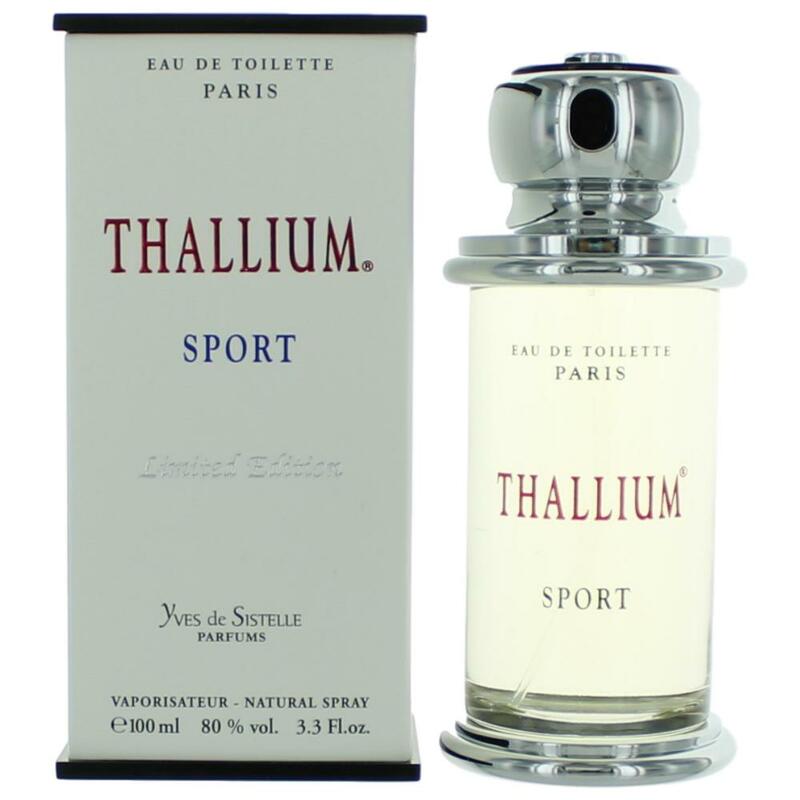 Thallium Sport smells very similar to Happy by Clinique. The drydown is lovely as the musky and citrus hips begin to sway, making the whole body of the scent move in sync, the projection of a dancer in motion. This is a happy summer daytime fragrance, but with a seductive gleam in its eye as the evening comes on. First impression was a mix of the two Avon fragrances Derek Jeter Driven and Derek Jeter Black. Which smells like a fruity Acqua Di Gio with a Le Male tonka sweetness. Not too sweet which is where this separates itself from the original Thallium. Very casual fragrance that would be great for a high schooler or college student. Can't really see this getting a lot of wearings from a more experienced nose. The reason being is that this and pretty much every thallium fragrance is a big clump of notes. There's almost no note separation so it makes it smell very synthetic. Nice budget fragrance. Pros: Great price. Versatile. Smells good. Cons: For it's price range nothing is negative." Believe me on this one, you can't beat a fragrance like this FOR THE PRICE! It's not like you're settling for a frag just because its a low price ($20.00). This juice smells good. If you paid twice the price you wouldn't be disappointed. There are no member images of Thallium Sport yet. Why not be the first?